Tour the headquarters of one of the world’s most important organisations. See the impressive chambers and artworks and monuments in the surrounding parklands. Join some of the many thousands of visitors each year who come to admire the majesty of the United Nations European Headquarters. Set aside a few hours to explore this important institution and to enjoy the elegant monuments set in surrounding Ariana Park. Take a tour of this historic building that has hosted gatherings of world leaders since its construction shortly after World War II. Learn about the history of global cooperation, which began with the League of Nations and exists today as the United Nations. Visit the various chambers and the enormous Assembly Hall, the Palais des Nations. See where heated debates and globally significant agreements are made. Guides are happy to inform you about the history of the institution and current issues being dealt with by the United Nations. The headquarters also houses a large collection of artworks that illustrate the goals of global equality and diversity. Look for notable artworks in the Human Rights and Alliance of Civilizations Room by famed artist Miqel Barceló, or the murals in the Council Chamber, painted by José Maria Sert. After exploring the buildings, talk a walk around the surrounding Ariana Park. This lush 46-hectare (1140-acre) landscape is home to 800 species of trees and a population of peacocks. Enjoy the peaceful atmosphere and see monuments such as the Celestial Sphere, built in 1939 to commemorate the foundation of the League of Nations. Visit the Ariana Museum, a charming neoclassical building which houses an impressive collection of ceramics. The United Nations European Headquarters is open weekdays year-round and on Saturdays in summer. Tours are available for a small fee and are available in 15 different languages. Centrally located, the headquarters is easily accessed by bus, tram or train. Be sure to bring valid personal identification for entry. Why don't you think about buying a Geneva City Tour & Boat Cruise? It's one of the most exciting experiences available here. 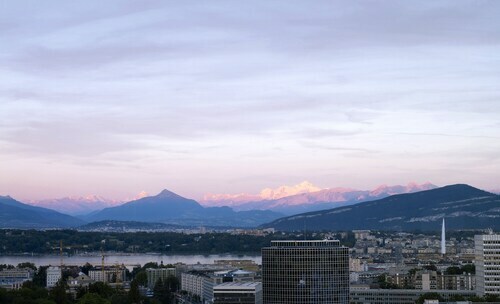 Have a look at our Geneva things to do page to discover more activities while you're in the area. Towering over Geneva’s old town is this 12th-century cathedral, known for its mixture of architectural styles and the Roman temple ruins that lie beneath it. Visit this iconic Geneva attraction day or night to enjoy this spectacular fountain shooting water high in the air. The city that gave birth to the International Red Cross is home to a museum dedicated to its work and humanitarian issues. Tour a fascinating museum that is filled with beautiful collections of ceramics and glass that cover 12 centuries of creativity. For centuries, this popular square in Geneva’s old town has served as a meeting place. Dine in a bistro, visit antique stores and admire the architecture. One of the most famous symbols of Geneva is a large working clock made of flowers that changes with the seasons. Historic protestant reformers and Geneva's involvement in the Reformation are honored in this remarkable memorial, a massive wall with huge sculptures. Browse the collection of antique watches and pick up insights into the evolution of one of Switzerland's most famous industries. Visit one of Geneva’s most popular parks to enjoy lakeside views, stunning fountains and the iconic flower clock, the Horloge Fleurie. Fossils, meteorites, mammals, precious stones and the earliest human ancestors inspire and delight science enthusiasts inside this free museum. Learn about tribal cultures and ancient civilizations through their distinctive art and relics. See why some of the pieces are considered to be masterpieces. Unwind in this historic lakeside bathhouse that serves up some of the best massages, fondue and views in Geneva. Follow the journey of human achievement in this grand old institution that houses artworks and artefacts from across the ages. Challenge a chess master, see monuments to the leaders of the Protestant Reformation or simply stroll along the tree-lined pathways of Geneva’s first public park. Gaze up at the spectacular ceiling paintings and note how the sunlight penetrates the stained-glass windows in this magnificent chapel. Located in the heart of Geneva, this luxury hotel is within 1 mi (2 km) of Park Mon Repos and Flower Clock. United Nations European Headquarters and Jet d'Eau Fountain are also within 2 mi (3 km). Butini Tram Stop is only a 2-minute walk and Mole Tram Stop is 5 minutes. This family-friendly Geneva hotel is located near the airport, within 1 mi (2 km) of Centre International de Conferences Geneve, Botanical Gardens, and Palexpo. Jet d'Eau Fountain is 2.2 mi (3.6 km) away. Nations Tram Stop is 8 minutes by foot and Sismondi Tram Stop is 10 minutes. 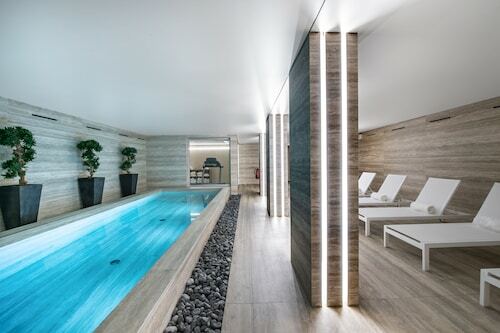 Situated in the heart of the city, Warwick Geneva is 300 meters from Lake Geneva, a 10-minute walk from old town, and a 6-minute train ride from the airport. Located 2 blocks from Cornavin Station near the UN headquarters, Hotel Royal offers a comfortable base in central Geneva. The Paquis Baths at Lake Geneva are a 10-minute walk away, featuring Turkish baths, a beach for swimming, and lakeside dining. The UN Building is within easy walking distance of Hotel Auteuil, and Cornavin Station is 2 minutes away on foot. It's a short stroll down to the left bank of Lake Geneva. Guests can take a ferry to the Old Town, enjoying breathtaking views of the Alps and the iconic Jet d'Eau fountain en route. Smart 5-story hotel set 300 meters from Lake Geneva and the railway station and 1 kilometer from St Pierre Cathedral. Located in Petit-Saconnex, this hotel is within 2 mi (3 km) of Franchises Park, United Nations European Headquarters, and Flower Clock. Jet d'Eau Fountain and Palexpo are also within 3 mi (5 km). Servette Tram Stop is only a 4-minute walk and Poterie Tram Stop is 8 minutes.